Since my East West Players playwriting workshop was overbooked, we added a second section, which means my entire Saturday morning and afternoon are dedicated to teaching. But since I abandoned the concept of a "workweek" long ago and my weekdays and weekends blend into one amorphous jumble of time, it's all good. Even though both classes are full, there are still half a dozen people on the waiting list—which is either a testament to the reputation that EWP has built over the years or which serves as random information to stroke my ego (or both). 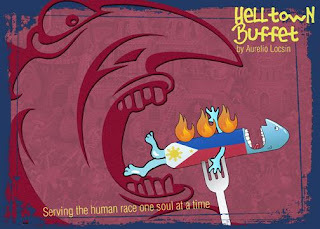 Aurelio Locsin's Helltown Buffet, a wildly imaginative comedy about demons, love, and Filipinos, has its world premiere at Rude Guerrilla Theatre Company in Santa Ana, California (the same theater that produced my adaptation of Scott Heim's Mysterious Skin a few years ago). Helltown Buffet runs September 19 to October 18, 2008. More information. Paul Kikuchi's Ixnay, a very funny play about Asian Americans in the afterlife, will premiere at East West Players in Los Angeles, California (the first home of my Big Hunk o' Burnin' Love and The Theory of Everything). Ixnay runs February 12 to March 15, 2009. More information. Tim Toyama's Yuri and Malcolm X, an eye-opening drama about Malcolm X's friendship with civil rights activist Yuri Kochiyama, recently won the Ruby Yoshino Schaar Playwright Award, which came with a dandy cash prize.